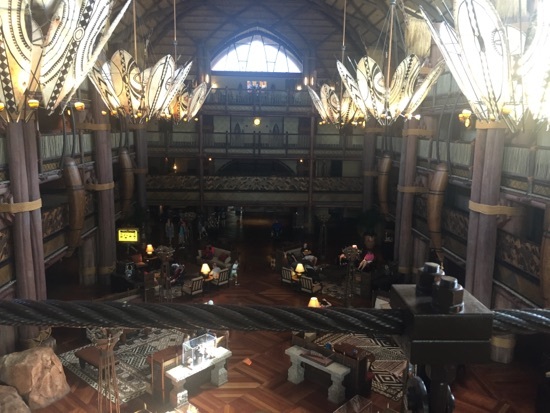 Today is check out day, so we're leaving animal kingdom lodge and heading back to the Radisson. We also have all 12 of our snack credits in tact so they need used today. 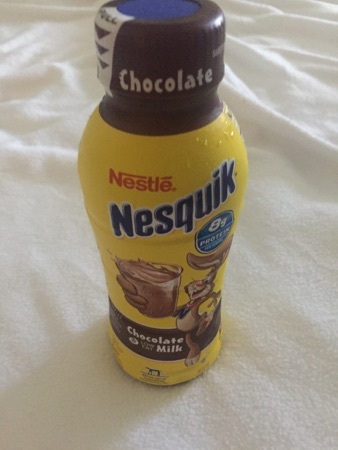 We started with breakfast, DD got a chocolate milk. 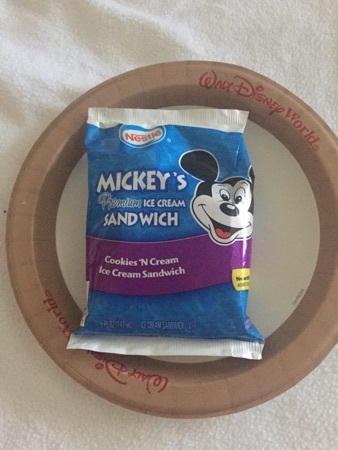 She also had a mickeys cookie and cream ice cream sandwich. Yep it's 8am and we're eating ice cream. 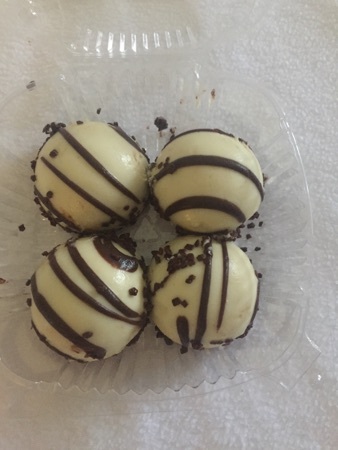 I got some zebra domes. These are a mousse on top of a thin sponge cake base covered in white chocolate. They're so tasty but really sickly, I only managed 3 along with a coffee in my refillable mug. 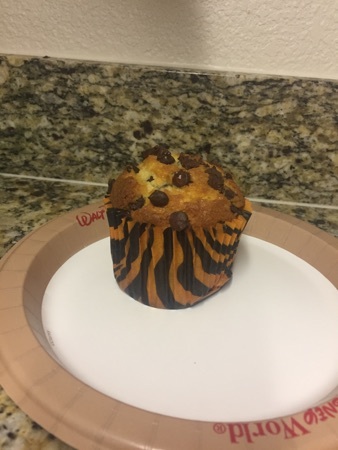 DH had a chocolate chip muffin with his coffee. We used 4 snack credits for these but it should have come to about $16 for them. We said goodbye to AKL and made our way to Epcot. We had a lunch reservation at Akershus, this is a new one for us. We checked in at 12.30 and we're meeting belle at the entrance 10 minutes later. We had a wonderful server here, she took our drinks orders, pomegranate lemonade for me, Coke for DH and DD had apple juice. After she took our entree orders we were able to help ourselves to the appetiser buffet. There were meats, fishes, cheeses and salads. 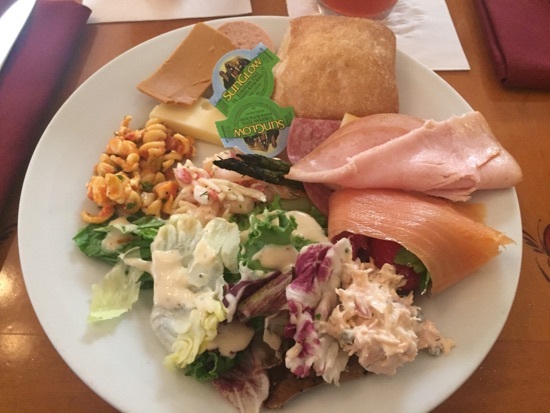 I got a bread roll, salami, ham, cheese, smoked salmon, asparagus, salmon salad, mackerel, Caesar salad, pasta salad and shrimp salad. This was a lovely selection of appetiser choices. I particularly likes the smoked salmon and salmon salad. DH had a similar plateful, his included baked salmon, pickled beetroot and gherkin what mine didn't. 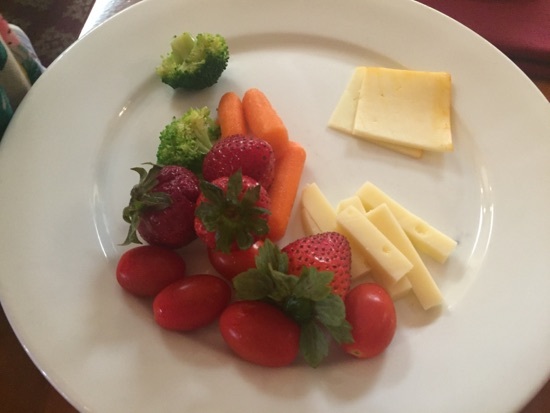 DD had some broccoli, carrots, cheese, tomatoes and strawberries. She ate pretty much all of this and then had even more strawberries. 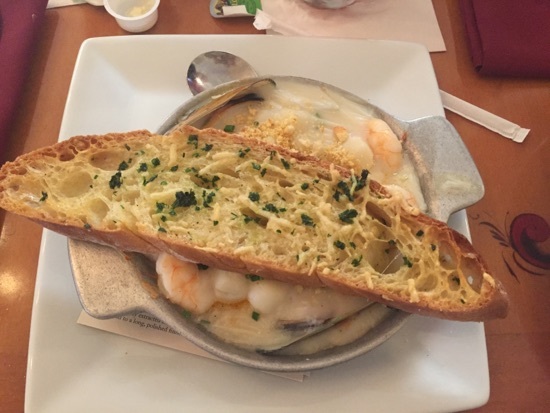 For my entree I had the Skalldyrsgryte - scallops, mussels, and shrimp casserole baked in a seafood and herb-cream sauce, this came with a large piece of roasted garlic bread. This was very nice, there were loads of little scallops in it and the garlic bread went so well with the sauce. 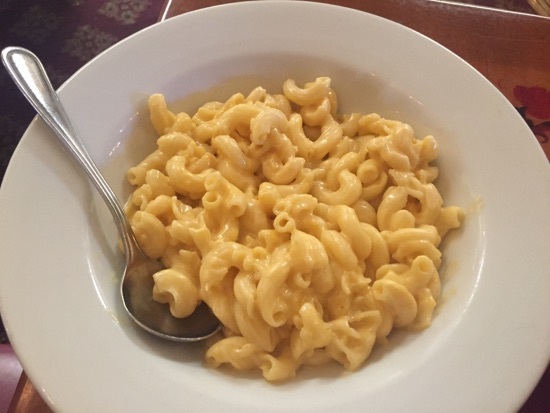 DD had macaroni and cheese, again she didn't eat a lot of this after her first plateful. 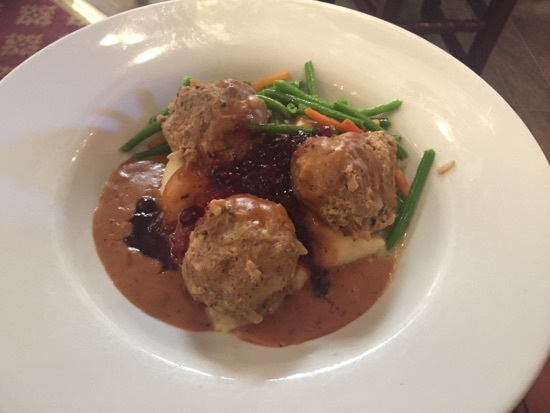 DH had the Traditional Kjottkake - Norwegian Meatballs served with Mashed Potatoes, Seasonal Vegetables, and Lingonberry Sauce. He enjoyed these and finished them off. Dessert was a sharing plate of 3 desserts. The first was a chocolate mousse, middle was an apple cake with salted caramel sauce and cream and finally rice cream with strawberry sauce, this was just like rice pudding. My favourite was the chocolate mousse, it was so light and chocolatey. My least favourite was the apple cake as it had a cinnamon flavour which I'm not a fan of. We really enjoyed this meal and the character interaction was really good. 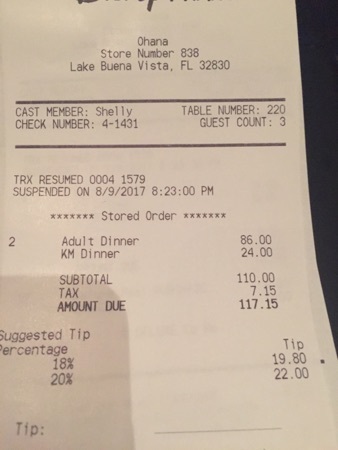 It cost $57 for an adult and $34 for a child so this is fantastic use of a dining credit. After lunch we had a wander round the world showcase and went on a couple of rides then made our way over to the Polynesian for our dinner reservation. 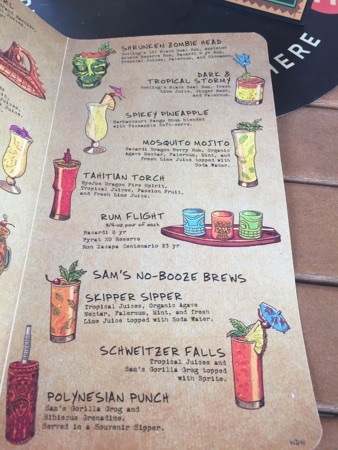 We were an hour early so we decided to grab a drink in trader sams. We sat ourselves at a table our on the terrace. I've wanted to come here since it opened and this was our first visit. 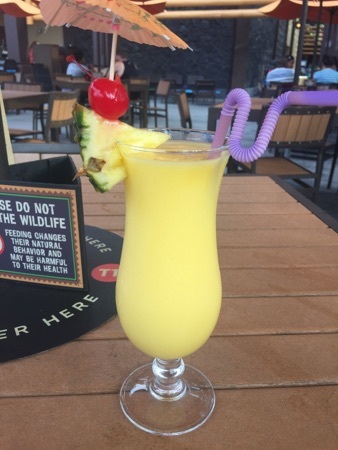 I ordered a spiky pineapple, this was pineapple soft serve blended with rum. It was absolutely amazing! I could have easily drank a few more of these, in not a huge fan of rum but it wasn't overpowering. 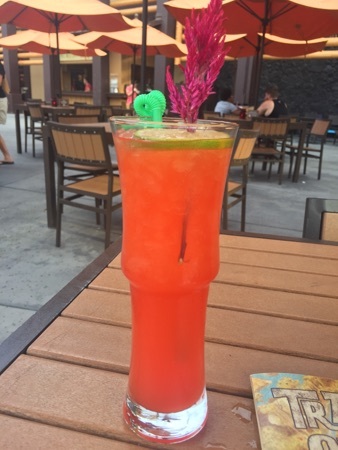 DH had a Tahitian torch, I definitely preferred mine, this was nice enough but had a definite taste of spirit. These came to $23.97, which I don't think is too bad for 2 cocktails at Disney. We enjoyed our chilled hour sat on the trader sams patio and DD slept in her pram the whole time. We then made our way up to check in for our dinner reservation at ohana, this is another favourite/must do for us, we've eaten here on our previous 9 trips. There's 3 things that sell it for me, the pot stickers, the steak and the bread pudding. It was really busy tonight and we had a half hour wait for our table. We were sat with a great window view and given our welcome bread. 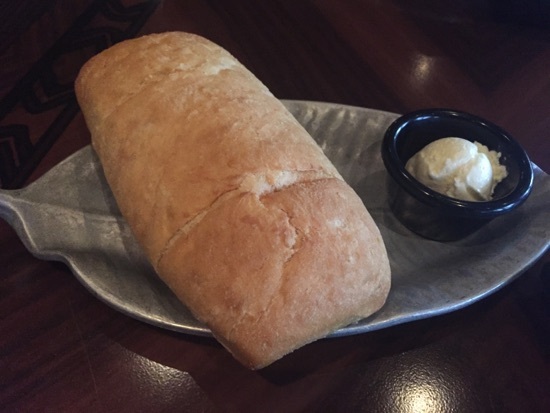 This is delicious it's pineapple bread and was served with whipped butter. 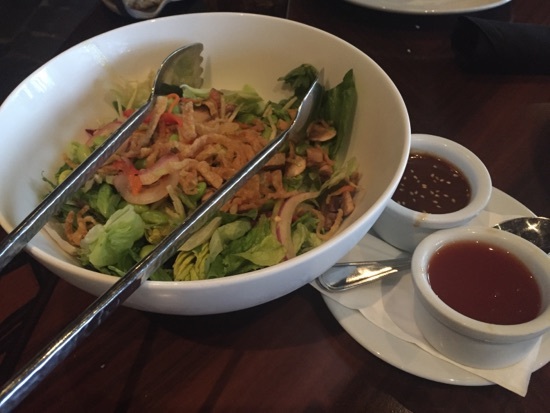 We were then given our salad and dipping sauces. The salad has a passion fruit dressing which is lovely. The dipping sauces are peanut and sweet and sour, I could eat buckets of the peanut sauces, it's my absolute favourite! 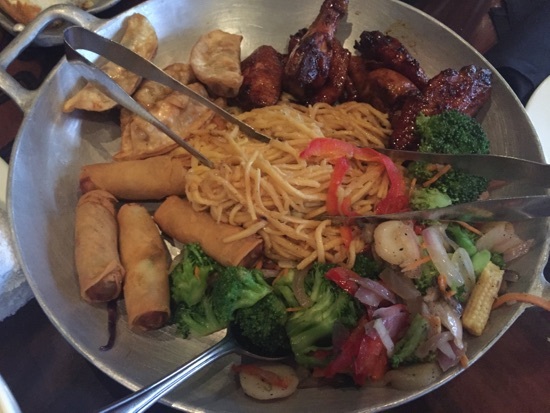 Then it was time for the potstickers, wings, noodles and broccoli, we were also given vegetable spring rolls which we've never had here before and some mixed vegetables. DD loved the vegetables and noodles, she'd also finished most of the bread. The potstickers were as amazing as usual and so good in the peanut sauce. 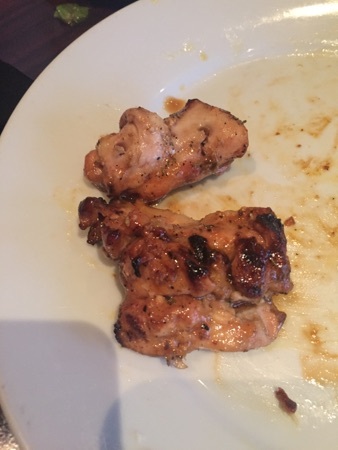 Our server brought us chicken first, this was really juicy and had the lovely smokey BBQ flavour. 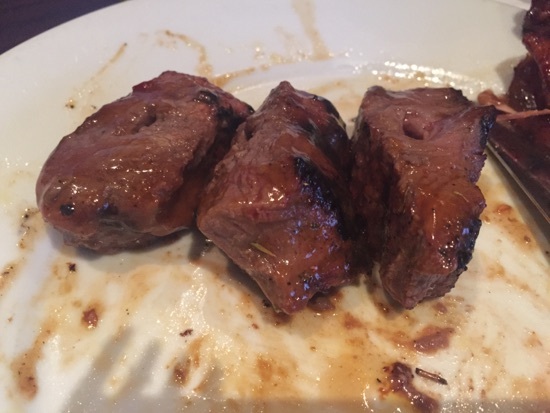 And next the steak, cooked almost perfectly, still pink in the middle (would have liked it slightly pinker). The charred outsides are so yummy! I passed on the shrimp as I'm not really a fan. 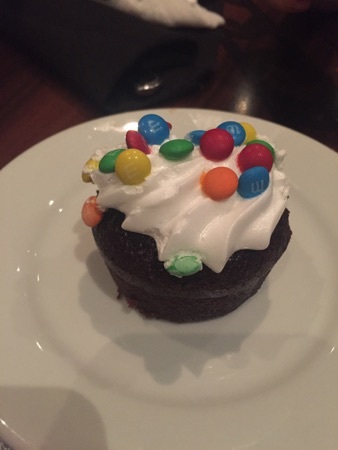 DD was given a brownie for dessert, topped with marshmallow cream and m&ms. 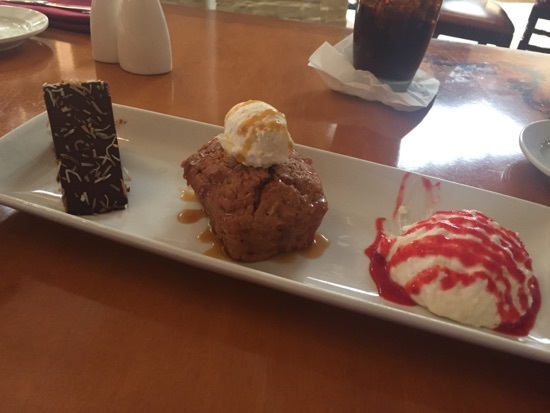 DH and I were given the bread pudding with vanilla bean ice cream and fosters sauce. This was amazing! Best dessert at Disney! 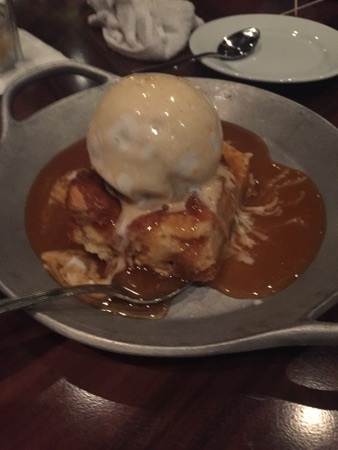 I love the crispy bits of bread pudding and there was loads of caramel sauce to go with it! We decided to hang around and watch the happily ever after fireworks from the poly beach. We had the small matter of our snack credits to take care of first. We used a few in captain cooks, some in moana mercentile and then the last one at pineapple lanai for a dole whip float, this was $5.49. 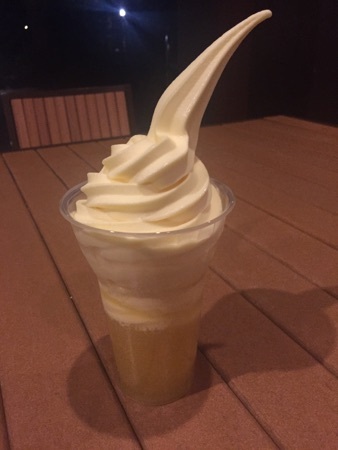 These are one of my favourite snacks in MK, pineapple juice topped with pineapple soft serve. So refreshing! After the fireworks it was time to leave the Disney bubble and head back to the Radisson. 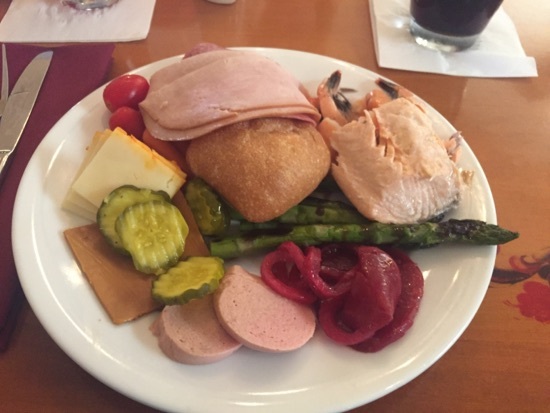 We've had a great time on the deluxe dining plan but it's so much food! We wouldn't eat like that normally but being on this plan for 2 nights and spreading it across 3 days allowed us to do the character meals we would have paid to do with DD anyway and a couple of our favourite meals with a significant saving. Our 6 meals came to a total of $768. 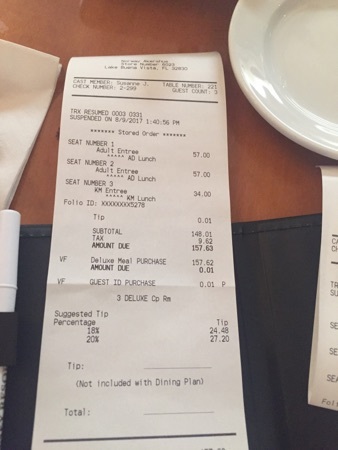 The dining plan cost us $489. We've also had $60 of snacks on the plan, a few of which we have stashed away for the next few days. We also got plenty of use out of the refillable mugs for morning coffees and drinks while at the pool, however I wouldn't have paid for these for such a short stay. Again your food looks delicious in Akershus, and good character interaction must make it even better. I've read so many mixed reviews of O'Hana. I'm not sure how I feel about it but I think I'd like to experience it. 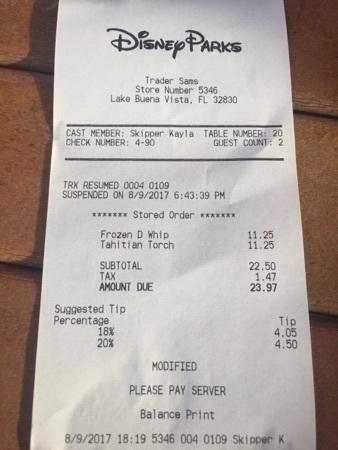 Good use of your last snack credit, again I've never had a Dole Whip but it is definitely on my list to try. New Photo Added by missdopey - 10 Aug 17 2:19 PM. 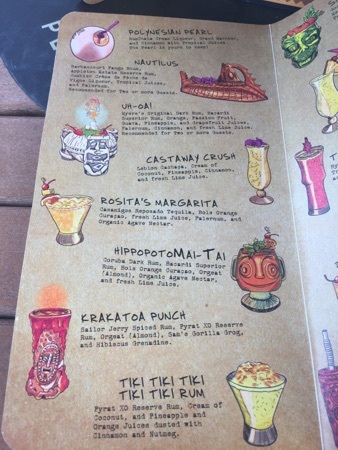 I loooove Trader Sams but not tried the Spikey Pineapple yet. I think after this I will put it at the top of the list. The food from Akershus looks really lovely & fresh.